LG WK9 XBOOM AI ThinQ Smart Display has just been announced and will be available in the United States and other key markets and regions. 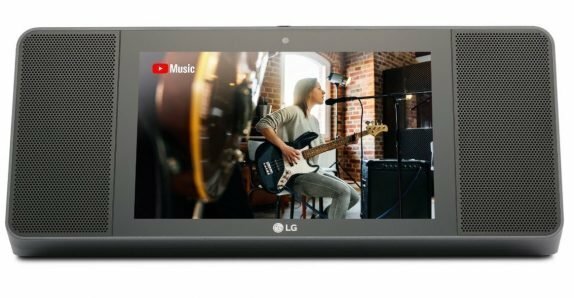 The LG WK9 XBOOM AI ThinQ Smart Display is literally a sound system which combines both Google Assistant and immersive sound quality from Meridian Audio. The Smart Display was developed in collaboration with Google and comes with a touchscreen display. The WK9 also leverages on LG’s partnership with Meridian Audio to deliver high-fidelity sound, precise vocal definition, and accurate bass, despite its compact size. It comes with a 5MP front-facing camera for video conference and 20W front facing speakers. The WK9 sports an 8-inch touch display and it also features the ability to control other LG ThinQ products. It runs on Android Things, measures 370 x 244 x 145mm and weighs 1.51kg. Our partnerships with Google and Meridian Audio allows us to offer a new home entertainment experience with the smart capabilities of the Google Assistant and the premium audio know-how that only Meridian could deliver. Unlike other AI speakers where sound quality takes a back seat to the brain, the WK9 is first and foremost a high fidelity audio product that also happens to be intelligent.